The Volkswagen Tiguan has seen an impressive amount of success in recent memory, and the 2018 model is one of the main reasons for it. While there are plenty of year-round incentives for considering this SUV—such as its high-tech features, cavernous cargo space and People First Warranty—now is an optimal time to bring home a Tiguan, especially for those who love in Cape May County. 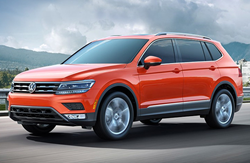 Now through the end of November, Burke Volkswagen—a part of Burke Motor Group—is hosting a leasing special for select models of the 2018 Tiguan. More specifically, all of the dealership’s 2018 VW Tiguan S models with 4MOTION® will be eligible for this promotion. That said, prospective customers must possess qualifying credit in order to participate in this leasing event. For more information about this, members of the public may speak with a Burke VW sales representative by calling 888-453-3452. Those who have qualifying credit will be able to lease a 2018 Tiguan S 4MOTION® at Burke Volkswagen for only $260 per month for 36 months. Better yet, the first down payment is just $627.74! Or, for those who’d prefer to save upfront, there is also an alternative payment plan. With it, one can lease a 2018 Tiguan S 4MOTION® for $347 a month for 36 months. In exchange for this increased monthly payment, participants will have a $0 down payment as well as a $0 payment for the first month of their lease! To learn more about the dealership’s current leasing specials, interested parties are encouraged to visit Burke Volkswagen online at http://www.burkevw.com. Once there, one will find several helpful resources, such as research pages, online inventories and virtual test drives. All are welcome to visit the dealership in person at 227 Bayberry Drive.